Us Brits love an underdog, and maybe that’s the reason we’ve warmed so wholeheartedly to the Speed Triple concept over its many years. It’s easy to forget just how long it’s been doing the rounds in Triumph’s ever expanding line-up, occasionally taking a few steps forward with an improved iteration, but never truly being able to willy wave at being the most high-tech, lightweight or powerful in its tough sector. And, being honest, it still can’t, but that doesn’t make the RS a second-rate option in any way whatsoever. Triumph are smart cookies; they don’t play the game of chasing crazy stats just to make a statement. And it’s no change from that approach with the new RS. When they kicked this project off all of three years back the Hinckley-based-massive had a very clear vision of how to take what was arguably a great bike and make it even greater. Yes, it needed more power. Yes, it needed more tech. Yes, it needed to go on a bit of a diet (don’t we all). But Triumph weren’t prepared to compromise integrity for figures; in both the numerical and shapely senses. The bike still had to be comfortable, characterful and useable; being just as well suited to popping to the shops on as it would be for mullering your mates on a trackday. In essence, it needed to be the Nigela Lawson of motorcycling – not just a pretty face, but capable of feeding your hunger in more ways than one. 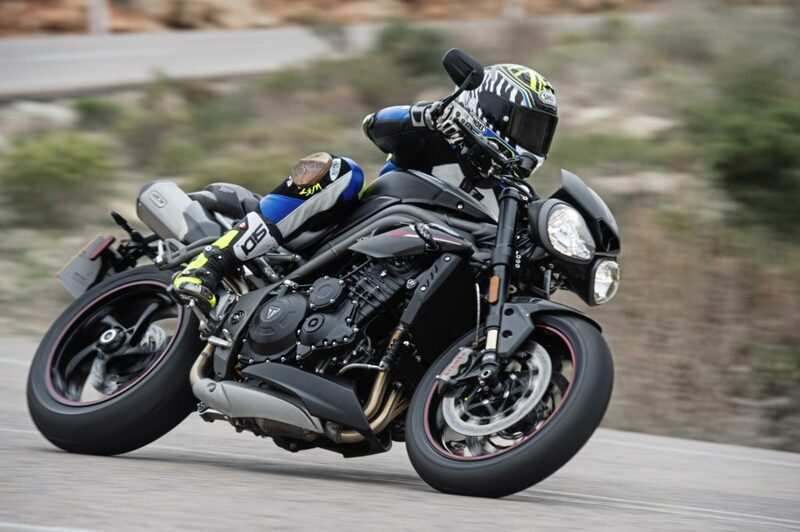 It’s that universal ‘one bike ticks all’ quality that’s cemented the Speed Triple into the icon that it is, and Triumph above all knows it’d be nothing short of foolish to let such a trump card slip from their grasp. So what’s changed? Lots. While the swingarm and frame remain identical to what they were on the previous model (including the rake and trail), there’s a list longer than one of Boothy’s extensive adult movie channel bills for all the many bits of goodness that have found a new home on the RS. Chief among which are 105 changes to the engine’s components. New pistons, a lighter crank, flywheel and a different cylinder head have all clubbed together, with many other parts, to see the three-cylinder motor peak at a claimed 148bhp of pure holiness. But it’s not just gained ponies. Torque’s up too, and the overall weight of the motor is down by a good chunk, aided by its redesigned sump that means it now holds a litre less oil than before (that should make a dint on servicing costs). While we’re on the weight theme, it seems only pertinent to point out the model’s 3kg saving over its predecessor. That’s a difference that’s not to be sniffed at, especially when you come to learn where the weight’s been saved from. The new 10-spoke wheels have chipped away in the un-sprung department, and backing up the rear, those lovely looking, featherweight Arrow cans have done a worthy job of taking unwanted weight from their high-up, rearward positon – helping to centralise the bike’s mass. And if you really want to get pernickety and count every last gram, there’s no overlooking the RS’s eye-candy carbon panels that bring more than just a bit of extra bling to the party. 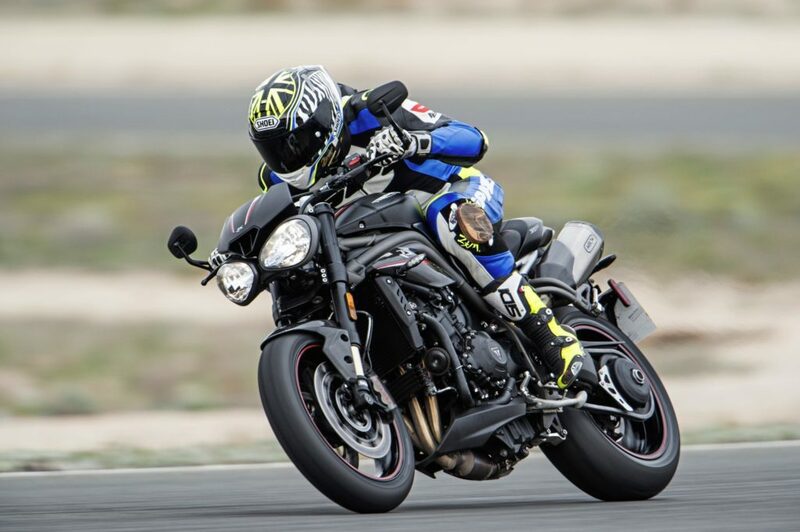 In total, Triumph reckons they shaved off just over 5kg compared to the previous version Trumpet, but they had to relinquish a couple of kilos for the added tech that’s come the Speed’s way. Following in the Street Triple’s impressive technological footsteps, the RS comes fitted with a luxury, colour TFT dash and all the switchgear trimmings you expect to find on a bike that features several different riding modes with accompanying traction settings, plus cornering ABS (that can also be switched off entirely), cruise control and heated grips. 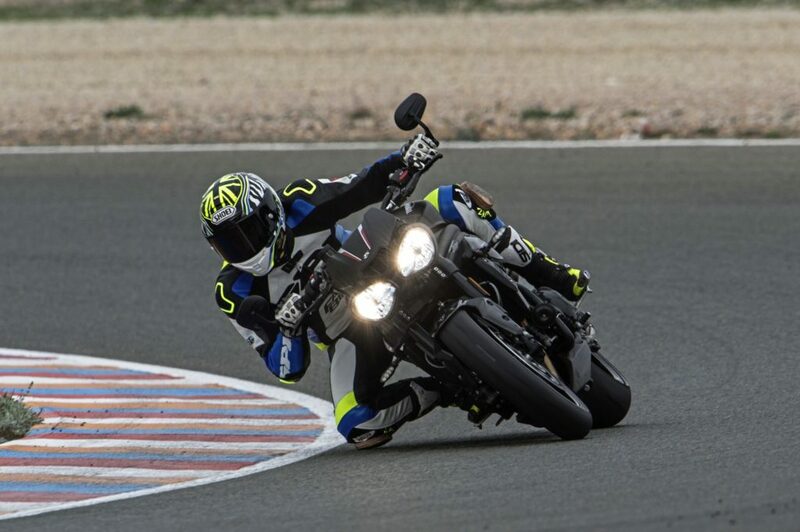 Yep, heated grips as standard, and having been close to a nasty dose of frostbite when testing this bike in the mountainous region of Almeria, I was bloody glad to have met their acquaintance. With a combo of road and track abuse on the cards, our three hours of road frolics kicked off with a stint of motorway, where I pushed every button I could find to help pass the monotony… including the all-important hand-warming jobby. Now I’m not normally the kind of guy who’d get all giddy about such a feature, but the simplicity of the effective three tier function, which introduced a colour representative icon onto the TFT dash, got me appreciating all the thought that must have gone into the whole switchgear setup. It looked super tidy, and every button felt easy to access and simple to operate. Including the cruise control, which got indulged so I could wave with both hands at the cars I was passing. Eventually the motorway got traded for a nadgery back lane that demanded a switch of rider mode. The RS comes with four riding modes (Rain,Road,Sport,Track), plus a customisable ‘DIY’ option, that allows you to enter into a special menu and bin off such features as traction control, ABS and other likeminded handbrakes. The stock modes alter power, traction and ABS levels according to your selection, which I tuned to ‘Sport’ for our first real assault of the day. It didn’t disappoint. With the harshest of throttle maps locked and loaded, I was unequivocally introduced to the potent nature of the RS’s package. Want more Fast Bikes? There’s loads to see on our Facebook, just click here! If Twitter’s the social space for you, well you’re in luck! 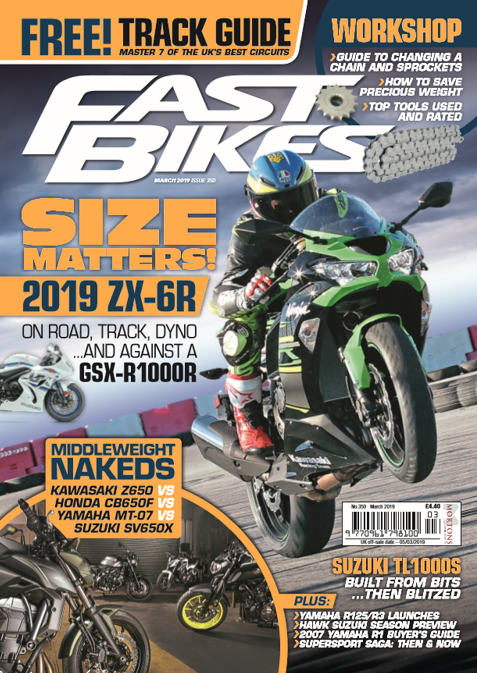 Follow FastBikes on Twitter here! The motor felt zesty, being quick to pick up revs and no less eager to gain pace. It still felt very much a Triumph, with a linear and determined power delivery that was smoother than Greek yoghurt smothered on silk bed sheets. Of course, the new blipper and shifter combo, which come as standard on the premium grade RS, made life even more tasty, as I worked my way up and down the triple’s seamless ‘box with footwork that would’ve put Michael Flatley to shame. The tech was faultless, and complemented the general premium feel of the Trumpet, which was simultaneously winning me over with its raucous exhaust burbles every time I down shifted and got me going up the ‘box just so I could come back down it. What a rebel. So far so good, and things only got better when the road got a whole lot windier and the true brilliance of the RS came to the fore. As already mentioned, there’s nothing new about the bike’s frame or geometry, but it felt more nimble than a pocket thief owing to its fancy new Öhlins pogos, that delivered the bike with the agility of a god. 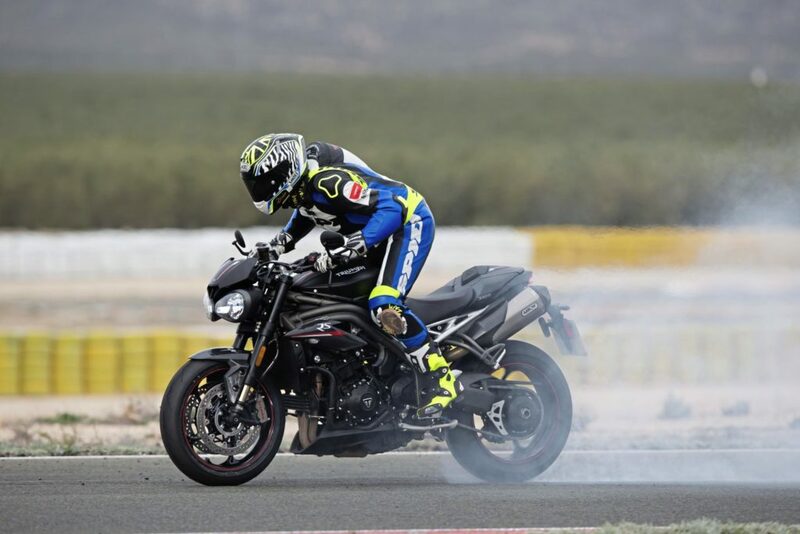 It’s often overplayed when people say litre bikes feel as nimble as a 600, but that was the exact impression the Triumph was giving off… and a bloody sorted 600 at that. Its road holding was unreal, with a plushness akin to the proverbial to a blanket. The RS was destroying every direction change that came its way with a level of competence that most sportsbikes simply wouldn’t be able to match. The high ‘bars made levering the bike around a doddle and the sportily positioned pegs only added to the impressive mix of cornering genius that had won me over hook, line and sinker. It’d felt light and agile the whole ride through, just as the last gen Speed Triple did, but this new found feat of brilliance was only truly digestible when faced with a road so relentlessly winding you’d be forgiven for thinking you were on some kind of fairground ride. There was nothing not to like about the way the Trumpet pranced around, which raised my adoration for the RS to a whole new level. 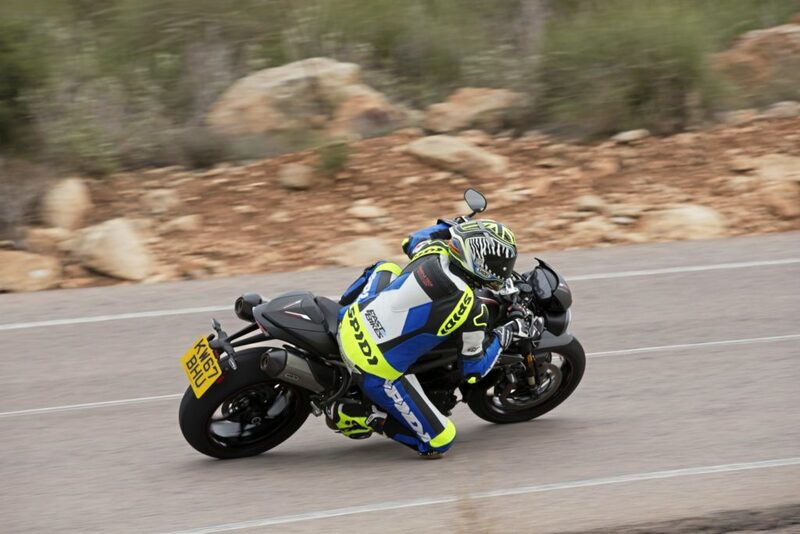 Not even the scabbiest bits of tarmac seemed to upset the Speed, which proved über stable even in the fastest of bends. On one particular section of undulating, open mountain road, fourth gear knee down for several miles was very much the order of the day, which I indulged with zero trepidation. I honestly think I’d struggle to say that’d be the case if I’d of been on any other of this bike’s main rivals, hammering home the virtues of Triumph’s collective package. It wasn’t just a one trick pony; it was delivering on all fronts to a level as delectable as Rachel Riley covered in chocolate. 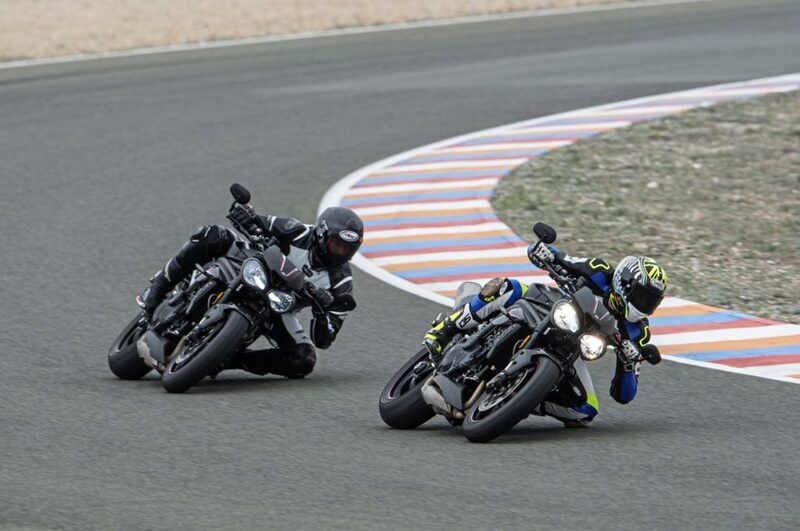 Of course, the real proof in the pudding came when we rocked up at Almeria race track. 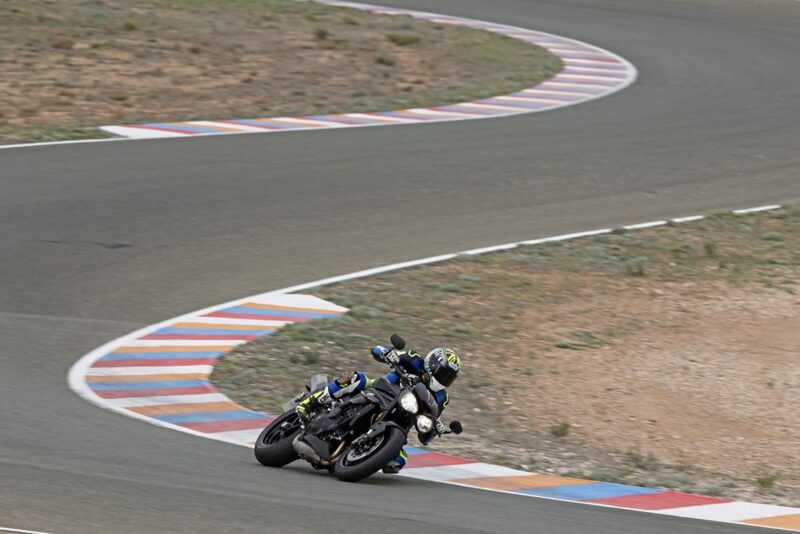 It’s a place I’ve ridden a few times before, and know first-hand how dependant it is on smooth lines and high-corner speeds if you want to clock a decent lap time. By this point in the day I had little doubt that the Triumph was going to perform well. The real question was knowing just how well it’d go? There was only one way to find out, and it was a pretty enjoyable method at that. With ‘Track’ mode engaged, automatically altering the ABS to an endo-able level and reducing the traction control to the most minimal of settings, the RS was to be toyed with in its least shackled state. Among other things, this meant the true extent of the fancy adjustable radial front master-cylinder could be exploited (you can alter the performance between a 21,20 and 19mm preferences). I chose to ride with the 21mm option from the outset, and was pretty blown away by the potency of the anchors. With my forearms straining and my neck muscles bulging like a steroid addict’s, I was just about topping out in 6th before hopping on the brakes for the final uphill section of the track. There was naff all effort required to get the bike hauled up, and things were made a damn sight easier by the engine’s decent slipper clutch, that stomached the abuse of downshifting four gears in less than 100metres, with minimal backing in. Ok, the colourful dash was lit up like a Christmas tree with all kinds of upper RPM warnings do their best to distract me from the upcoming apex, but who ever pays that much attention to verbal warnings from hyped up dashboards? The physics of the package were what mattered, and there was little complaint in that department. I also found myself a fan of the ‘Track’ mode’s circuit inclined traction setting. It’d let you get away with a bit of slide on the exit of corners, but it was always there to stop things getting out of hand. All day long on the road the system had shown its head in ‘Sport’ mode every time a power wheelie came in to the mix, or when an undulation provoked the chance to get the front wheel skywards. As annoying as it was being a bit of a killjoy, the actual system proved accurate, efficient and generally inclined to help you keep going as fast as possible. The same had to be said on track. I never felt as though the system was holding me back, and there were a few occasions when I reckon I’d of been gifted to a free flying lesson had it not of been there. Just to be thorough, I did also ride the bike with no traction and no ABS, which made negligible difference to my lap times, but it brought out my inner child full bore. I couldn’t help but want to wheelie the thing at every given moment, and the same goes for burnouts. Going fast is all well and good, but that’s not all the RS is good for. It’s a loveable headcase that’ll lead you astray at the first opportunity, and that only made me love it even more. What was the model’s focus? “The concept for the model came to reality three years ago. We wanted to build a bike with more torque and more power. Also, when you introduce more power it makes you question how suitable the chassis will still be? We had to look into whether we needed to change the package to suit the new bike’s increased output, but tests proved that we didn’t. 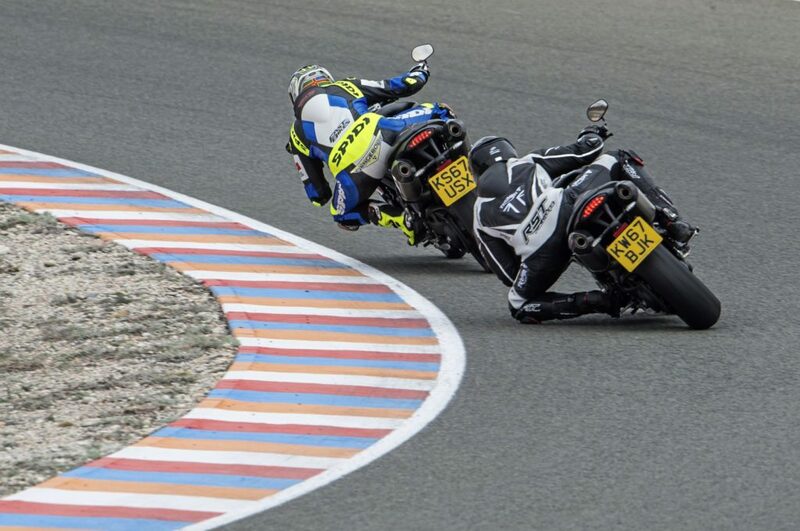 And because the handling of the bike was so fantastic, both and high and low speeds, we didn’t have to change a thing. I honestly don’t believe there’s a rival on the market that can offer the handling package we do, and that’s down to finding the best geometry and locating the mass of the package in the right place. We’re very happy with how we’ve moved the goalposts. Were you pressured into adding more tech? Yes, I think so. The market moves on and people are always proud to tell people that their bike has the best features. It also helps them feel more comfortable with their bikes if they know they have a top level technology. 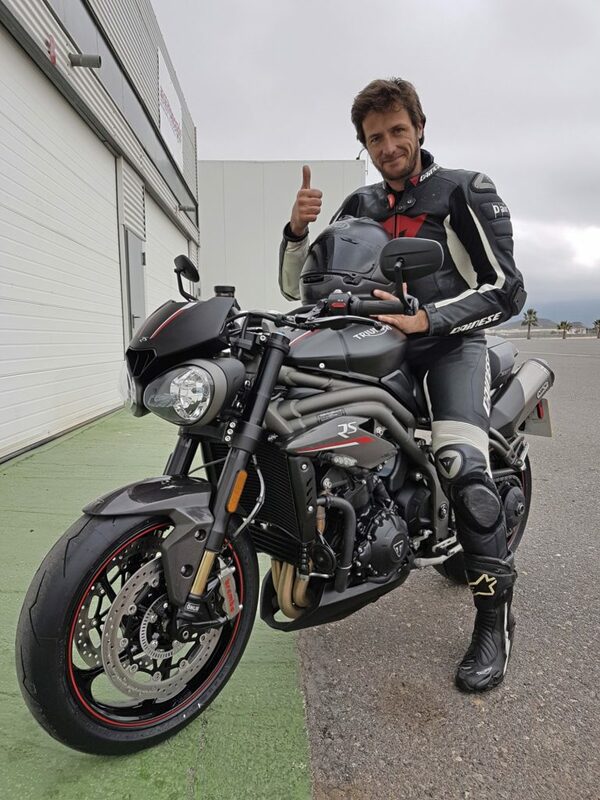 We’ve added a lot of features to the Speed Triple package, and we believe it’s now at the pinnacle of technology on the market. 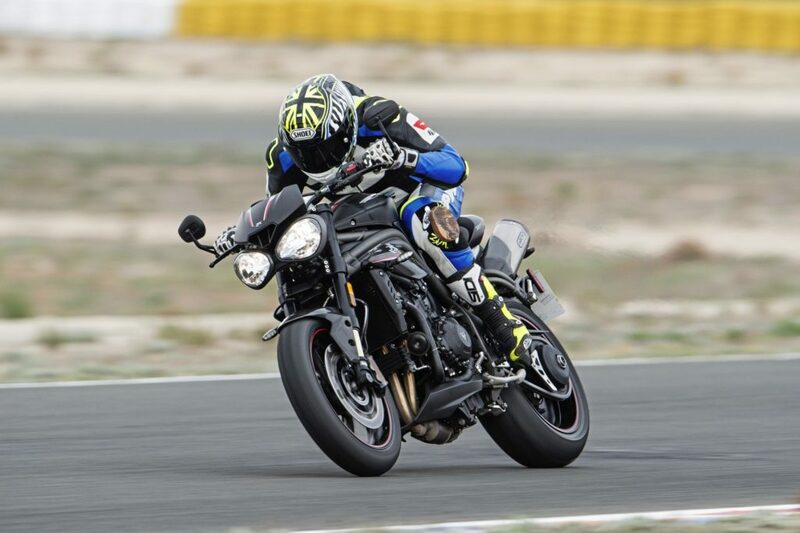 It was great to integrate the TFT dash (from the Street Triple) on the bike, and all the other things like cruise control and cornering ABS. We believe it now has every piece of tech needed. Could you have drawn more power? You can always get more power. We could have matched our main rivals with 160bhp, but that would have meant compromise. 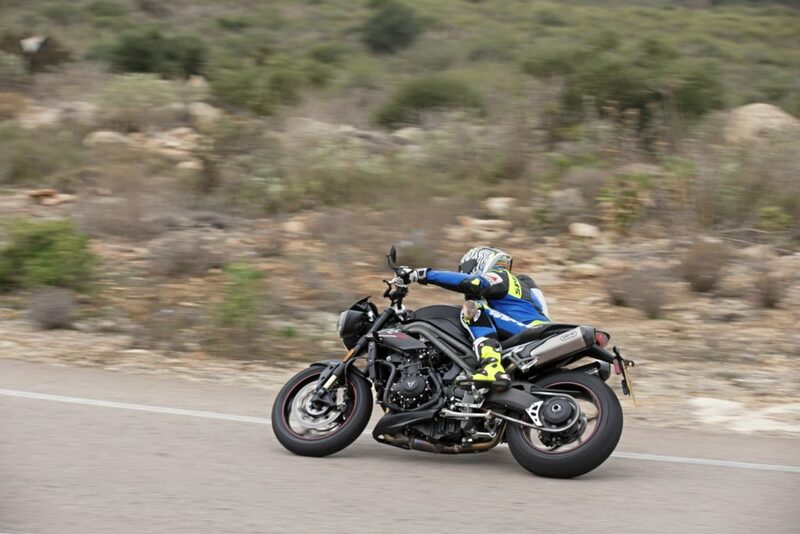 The best thing about the Speed Triple is the way in which it makes its power and delivers it in a very useable and satisfying way. We’re very happy with the power figures we’ve achieved with the RS, but more so with how well the motor delivers its performance to the rider. Figures aren’t always the best thing to go by; we care more about the riding experience. We wrapped the day up with a 45-minute blast back to base, ticking off more great mountain roads and being gifted with one final chance to exploit the Trumpet’s offerings. It seriously got me questioning whether I’d choose this bike over the typical faired all-out sportsbikes I’d be inclined to go for, and I saw lots of advantages to this weapon. It was comfortable for starters. We’d clocked some serious miles that day and I still felt fresh for more. And then there was the great character and diversity of the bike, which seemed to adapt to whatever kind of riding you felt like doing at any given time. It probably wouldn’t be the fastest thing on track, but it would hold its own, and while its general lack of wind-protection would probably prove a bit of a ball-ache on long treks to faraway places, the wind buffeting didn’t seem all that bad below 70mph. But for all its weaknesses there were just as many strengths. Once you’ve ridden one of these and have grasped the brilliance of its handling, you’ll know why it’s got me thinking so hard. And then there’s that motor, which drew me in as much for its performance as it did by its soundtrack. The tech’s pretty hard to fault also, and I love how customisable the package is – even if you do have to reselect your rider mode every time you switch the bike off. Yeah, it’s not perfect, but back home on typical B-roads, I reckon you could have your work cut out trying to hunt one of these down. Triumph’s done a top job here. 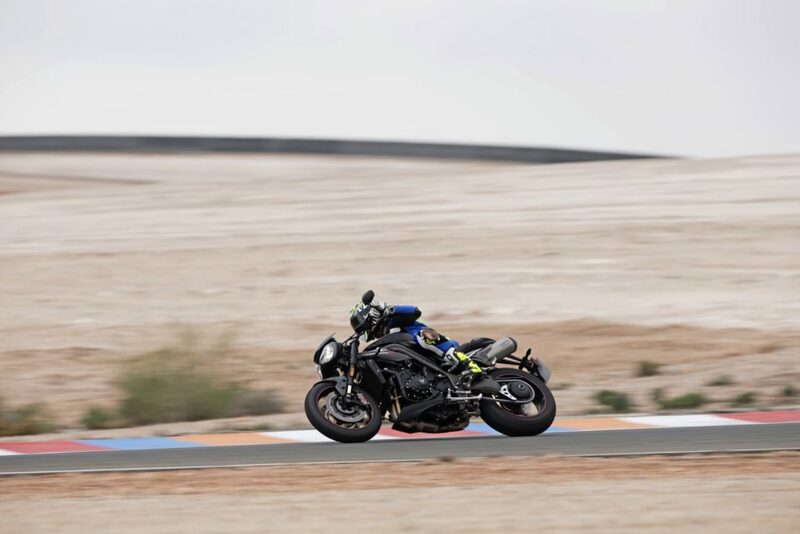 It’s as if the Speed Triple’s finally come of age, with all the glitz, tech and performance we’ve been craving for over its last few iterations. It really is the best of British. Previous Post:FREE FEATURE! 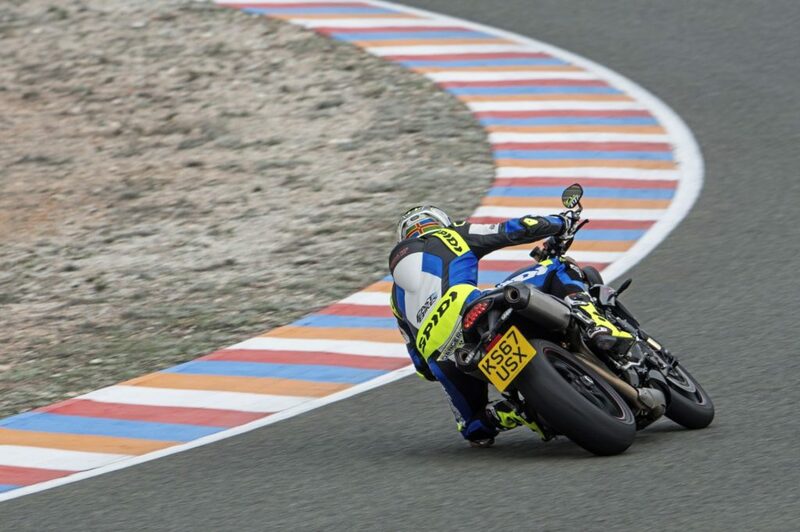 Michelin and MotoGP: A Match Made In Heaven?